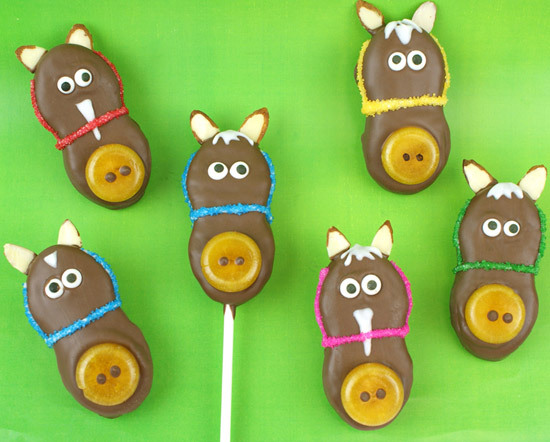 Fun and cute horse cookie pops - great for Triple Crown parties and any horse lover! 1. Melt Chocolate CANDIQUIK® in Melt and Make Microwaveable Tray™ according to package directions. 2. Using two utensils (I used a fork and spoon), completely cover Nutter Butter cookies in CandiQuik, let excess coating drip off and place on wax paper. 3. Before coating has set, press 1 butterscotch candy on the end of the cookie as a nose and 2 eye-shaped candies towards the top of the cookie; allow to dry. 4. Once dry, dip the very ends of 2 almond slices in the CandiQuik and press on the top of the cookie, hold until set in place. 5. Melt Vanilla CANDIQUIK® according to the package directions and use a toothpick to add facial markings (stripes/stars, etc. ); allow to dry. Nutter Butter is a registered trademark of Nabisco.